Many scientists find themselves in an uncomfortable position. They are caught between environmental advocates looking to recruit allies and right-wing activists who demonize researchers and denigrate their work. The change in language appears to be driven in part by the Trump administration's open hostility to the topic of climate change. Earlier this year, President Trump pulled the U.S. out of the Paris climate accord, and the President's 2018 budget proposal singled out climate change research programs for elimination. Meanwhile, the Environmental Protection Agency has been systematically removing references to climate change from its official website. Both the EPA's leader, Scott Pruitt, and Secretary of Energy Rick Perry have said they do not accept the scientific consensus that humans are causing the planet to get warmer. "In the scientific community, we're very cautious people," says Katharine Hayhoe, the director of the Climate Science Center at Texas Tech. "We tend to be quite averse to notoriety and conflict, so I absolutely have seen self-censorship among my colleagues. [They'll say] 'Well, maybe I shouldn't say it that way, because whatever funding organization or politician or agency won't appreciate it.'" The NSF data appears to bear out the change in language. 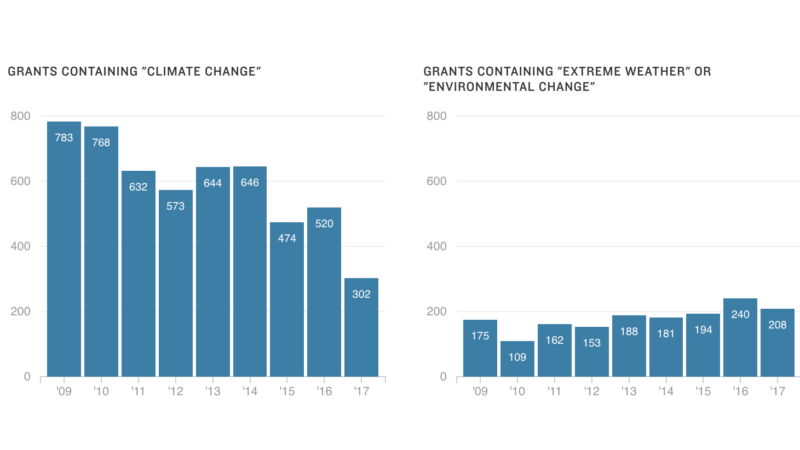 While the number of grants with the term "climate change" in the public summary has dropped, the number of grants with the terms "environmental change" or "extreme weather" has increased slightly. That suggests that, even if research topics remain the same, the words scientists use to describe them may change. "Scientists I know are increasingly using terms like 'global change', 'environmental change', and 'extreme weather', rather than explicitly saying 'climate change'," Jonathan Thompson, the senior ecologist at the Harvard Forest, wrote in an email to NPR. Thompson has been the lead investigator on multiple research projects funded by the NSF in recent years. "This seems to be born out of an abundance of caution to limit their exposure to any political landmines in what is already an extremely competitive process," he wrote. Four other climate researchers acknowledged that they had personally removed the term "climate change" from funding proposals or public summaries in the last year, or had advised graduate students who had done so. All were concerned that if they disclosed their names, it could negatively impact their future funding competitiveness. 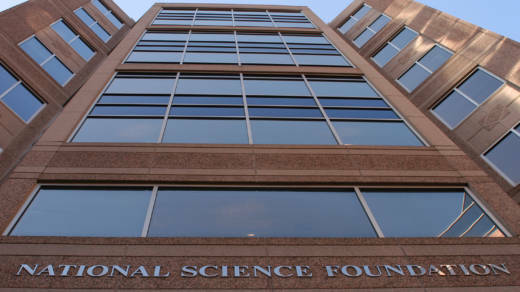 The National Science Foundation is widely regarded to be among the most independent bodies funding federal research, so it's particularly notable when politics seeps into statements by agency officials. Earlier this year, the head of the NSF geosciences directorate, William Easterling, fielded a question from a climate scientist about the language used to describe NSF priorities. "Let me just be perfectly honest, the appetite of NSF right now is doing as little as it needs to to, you know, poke the bear, and yet stand by our scientific principles," Easterling said, according to a report by the American Institute of Physics, a trade group for physicists and engineers. The term climate change, Easterling noted, is "a polarizing icon, for better for worse — obviously for worse, from a scientist's perspective." Multiple scientists said Easterling's comments were one reason they felt it prudent to avoid using the term "climate change" in grant proposals if they could. NSF spokesperson Aya Collins wrote in an email to NPR, "NSF takes no position on the language used by researchers to describe physical processes and outcomes if the merit review process judges the language to be appropriate." But after a research project has been approved, some scientists say NSF program officers encourage scientists to avoid using the term "climate change" in the public title and description that gets published on the NSF website. Not everyone sees that as a problem, given the political environment. "Every interaction I've had with NSF program officers about using the words 'climate change' under the current administration is not anything I'd consider a negative form of censorship," says Michael Dietze, a climate scientist at Boston University. "I think we have staff [at NSF] who are genuinely trying to protect U.S. science and U.S. scientists in a hostile environment," Dietze adds. "I have been asked to contact you to update the wording in your proposal abstract to remove words such as 'global warming' or 'climate change'. This is being asked as we have to meet the President's budget language restrictions and don't want to make any changes without your knowledge or consent." As the DOE email suggests, White House rhetoric can have immediate effects on how scientists describe their research. It's unclear what language the email is referring to, but, among other things, President Trump's budget proposes $50 million in cuts to the EPA's Air, Climate and Energy program and rebranding it to remove the word "climate." At the NSF, it remains unclear whether there is a real threat to research branded "climate". Even scientists who said they have avoided the term "climate change" in grant proposals say they haven't seen evidence of direct political meddling in the NSF process for determining who wins funding. That is echoed by Mitch Ambrose, a policy analyst for the American Institute of Physics. "I haven't seen any evidence that the Trump administration has issued any specific guidance to NSF," he says. Spokespeople for the House Science and Technology Committee, which oversees the NSF, and the White House Office of Science and Technology did not respond to requests for comment. This is not the first time scientists have resorted to euphemism to protect their research. Early studies of human sexuality referred to "fertility-related behavior." Stem cell research was referred to by some Bush-era researchers as "therapeutic cloning." "Some people have shifted away from climate research altogether," in recent years says Philip Mote, the director of the Oregon Climate Change Research Institute at Oregon State University. The perception of censorship and fierce competition for funding could lead talented students to more lucrative fields such as software development. Avoiding the term "climate change" could also lead to a more fractured scientific community. Climate change research is an inherently interdisciplinary field and shared terminology allows people to collaborate, either through interagency groups or through university departments that reflect the larger trends in available funding. "If we all have to go off in different directions to keep the science moving forward, we lose that community," says Dietze. "We won't gather and work together." And all of that could translate into problems for average citizens. Cities, some of them already dealing with rising sea levels and more severe storms, rely on the federal government for information about climate change. Water resource managers and emergency officials look to federal climate programs for long-term data. And insurers are using climate change data to determine rates for homeowners. "This is the biggest environmental challenge in human history," says Mote. "Absent political winds, I don't think researchers would avoid using the term 'climate change' to describe it."